The boto or Amazon River dolphin (Inia geoffrensis) is endemic to South America and is the most studied species of river dolphin in the world. It is unique in that it is the only toothed dolphin to possess different types of teeth in their jaws, ranging from conical styles to the front and crushing, molar types towards the back. They feed mainly on fish and shellfish but have been known to occasionally forage on turtles. There are currently three recognized sub-species of boto: those located in the Amazonia river systems of Brazil, Peru and Ecuador; those within the Orinco basin of Venezuela and Colombia; and finally, individuals located within the Bolivian waterways. However this taxonomy is highly controversial as genetic studies argue that the Bolivian sub-species are in fact a completely separate species in their own right and scientists have yet to agree on a formally recognized classification. 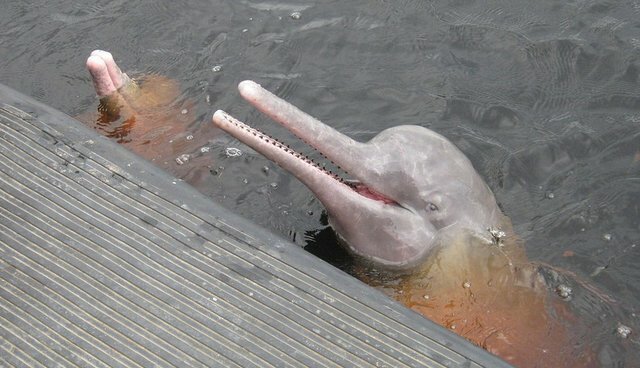 The status of Amazon River dolphins has only recently been considered to be at risk, showing sharp declines since 2000. It is estimated that they are declining between 7 percent to 10 percent a year. However despite the declining population they are currently listed only as Data Deficient on the IUCN Red List despite previously having a status of Vulnerable. This listing was reversed due to a lack of reliable data concerning their ecology, population numbers and distribution despite the species being the most studied river dolphin in the world. 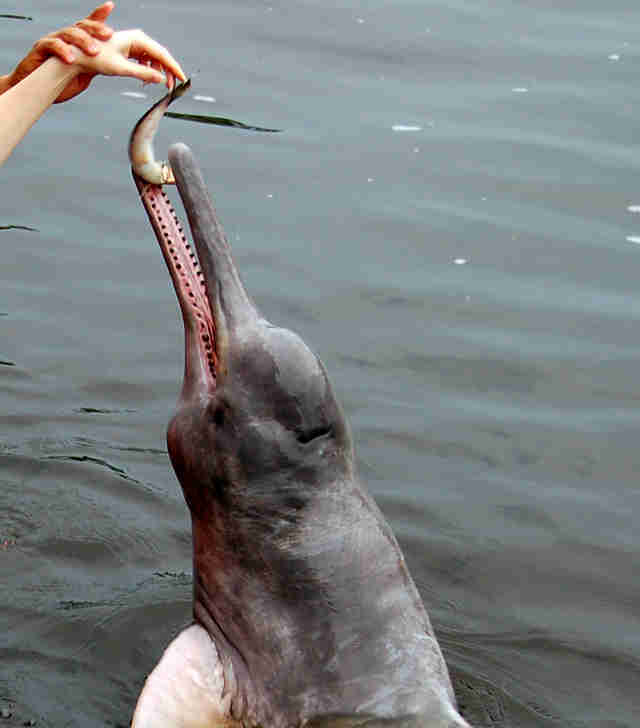 All river dolphin species are under threat globally and this has only recently begun to be taken seriously following confirmation that the Yangtze River or Baiji dolphin is now functionally extinct. This was the first large vertebrate in half a century to be driven to extinction as a result of anthropogenic activities (unsustainable shipping, illegal fishing, habitat encroachment, polluted waterways). The main threat to the Amazon River dolphin is from commercial fishing where they are either killed by fishermen as a perceived competitive threat or used as bait for the lucrative catfish industry which feed on their carcasses. Roughly 1,500 botos are killed each year as bait, with a single dolphin carcass helping to produce 550 kilograms (approx. 1,212 pounds) of catfish worth £30 per kilogram. This equates to roughly £300 (approx. $464) in two nights which is more than double the national minimum wage in the region, highlighting the huge demand for these river dolphins. Unfortunately fishing pressures are not the only threat currently impacting the dolphins. Many are injured or killed by boat strikes of from propellers as they are naturally inquisitive and attracted to noise; this also makes them very easy to hunt by fishermen. Rising mercury levels in the local rivers have led to contamination of prey and the construction of dams is reducing the food available as fish are unable to swim upstream. The most pressing issue for the conservation of the Amazon River dolphin is to address the data deficiency regarding their current population size and distribution. Without this the species can't be recognized as endangered which makes implementing government protection difficult. They are currently listed in Appendix II in the CITES list of restricted animal trade, however this is ineffective in the home range of these animals as the areas are remote and not well enforced. In Brazil, for example, the punishment for killing river dolphins leads to 18 months in prison however with just five agents monitoring an area twice the size of Texas, enforcement is an impossible task and people are rarely punished. Therefore non-governmental organizations (NGOs) working in the region have switched their attention to trying to address the need for greater job opportunities and better pay to prevent locals turning to the lucrative catfish industry. The Whale and Dolphin Conservation society has worked in Colombia for more than 20 years and has developed potential sources of new income including training locals to be Amazon nature guides; carving of traditional tourist souvenirs; hiring local people to work on behalf of charity foundations etc. They also run workshops aimed at educating school children on the importance of the dolphins to the local habitats and to inspire the next generation to conserve the environment around them. There are currently plans to establish a RAMSAR wetland site in the Orinco region of Colombia which will prevent further human development and help to restrict illegal fishing in the area, reducing the anthropogenic pressures on Amazon River dolphins to allow them to maintain healthy population levels. If you have a passion to conserve the futures of endangered animals then our Wildlife Conservation Projects are perfect for you!